Today Harry Potter and the Deathly Hallows Part 2 is being released on DVD and Blu-ray, so I thought it was a fitting time to post our fan film and recap of our summer fun with Harry! Here at My Mid-Life Motherhood there's a certain art to balancing the various ages and interests of our particular family members. 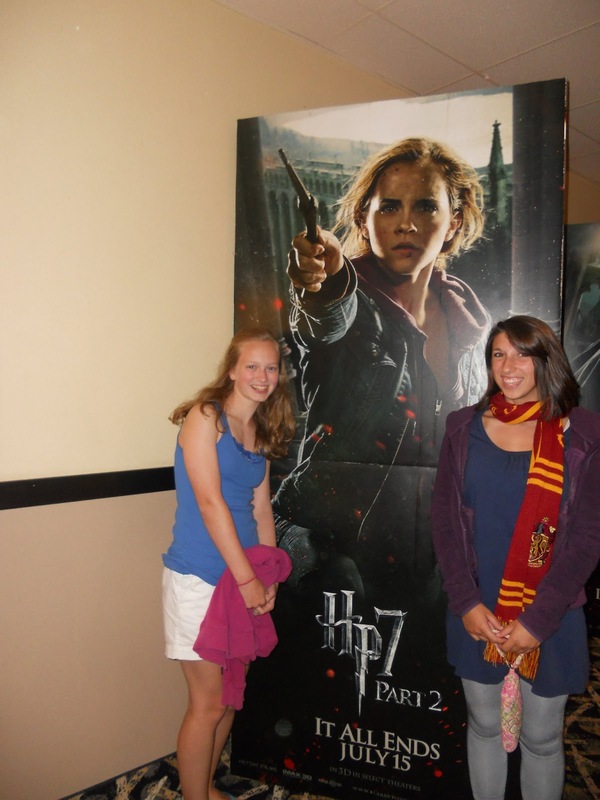 One thing that seems to span the gap in our humble abode is our love of movies! Even Cupcake enjoys her "show!" when she gets to watch Mickey Mouse Clubhouse or join the family for some good ol' Disney classics. was as excited as a teenager at the prospect of seeing the epic conclusion to the movie series of a generation! dressed up as Mrs. Weasely for the midnight show! 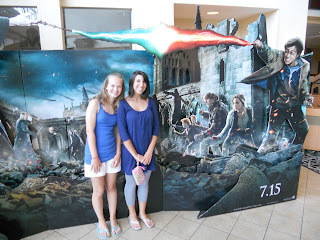 enjoyed seeing it again on IMAX 3-D opening weekend! On our way to the midnight show! 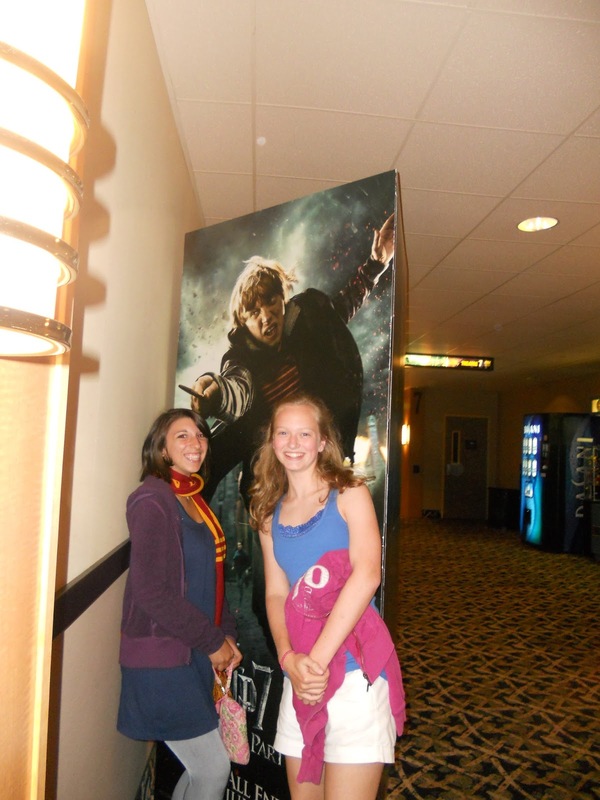 "Random Death Eater" & "Mrs. Weasley"
My son and I enjoyed dressing up to see the midnight show on opening night! We had a wonderfully fun audience, which made the experience superb. Lots of cheers, hoots and hollers could be heard emitting from our theater during the film. Many people came decked out in the Griffindor colors, Hogwarts uniforms or unique Harry Potter themed regalia. 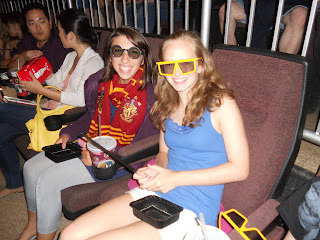 The theater passed out special Harry Potter 3D glasses, too! A Rare friend joined us for the 3D show! Loved the Harry Potter 3D glasses for everyone! I wasn't sure how my 13 year old would stay awake for the entire show, but we soon realized that it was impossible to sleep through such a film. It is an action packed war movie! Between the fast paced film and the caffeinated drinks, he managed to enjoy the entire adventure! Fun first midnight show for Bud! Hard to believe I was seen in public dressed like that?! Having kept ourselves filled with popcorn and soda, we made our way home for bed in the wee hours of the morning. Naturally, we excitedly talked about our favorite scenes and grew eager with anticipation to see it on the even bigger screen with the entire family! Lookin' good for 3 AM! Perfect full moon to end the night! After recovering from our midnight antics with Harry Potter we enjoyed seeing it for a second time on opening weekend at the IMAX theater! Darlin' had missed midnight show because she was away on a mission trip, so we made it another family event to see it on the really, really, really big screen. Darlin' and Joy decked out for the movie...wand in hand! It was quite an experience to see it in IMAX 3D. I truly felt that it was worth every penny. The 3D effects were superb on such a large screen and made everything come to life - that element was lost on the smaller screen. As wonderful as the experience was the first time around, I found it even more enjoyable the second time around...perhaps a good night's sleep had something to do with it! Photo Ops with the stars. They searched every display til they found Ron! Our family has thoroughly enjoyed our time together reading the Harry Potter books, watching the movies and making our own family fan film. Darlin' and Bud even had the chance to go to the new Harry Potter amusement park in Universal - the perfect spot to whet their appetite (with a little butter beer) for this epic finale to an exceptional series!